It is well-known that gravity limits the form and size of life. Scientists have been explaining for centuries how and why this happens in numerous science books and papers. Prof. Brian Cox's new 2013 book Wonders of Life reaffirms these thoughts in detail and notes that "On a planet with a weaker force of gravity, trees constructed from lignin could therefore grow much taller than they do on Earth..." (p121), "Any structure scaled upwards on Earth will eventually fail under its own weight ... because the force of gravity acts in proportion to its mass." (p135) Ultimately, then, the size of animals on land is restricted by the strength of bone and the mass of the Earth. On a planet such as Mars, given the same bone strength, animals could be more massive because Mars's gravitational pull is around a third of the Earth. This would permit, in principle, larger animals to roam the red planet." (p139), "It is not the availability of food or the outcomes of evolution that ultimately decide the size of the largest land-based animal - it is gravity." (p138), "... there is a maximum size, which on land is set by the size and mass of our planet, because the force of gravity restricts the emergence of giants." (p161). There is no doubt that the size of life is controlled by the strength of gravity and this is exactly the point I make in the first few chapters of my Dinosaurs and the Expanding Earth book. All land-based life is limited in size by gravity due to the scale effect. 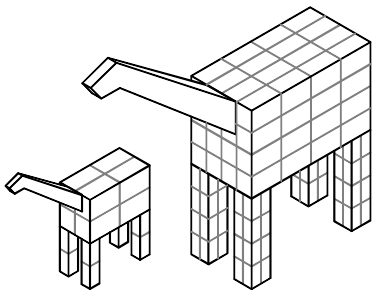 This is a relatively simple concept: consider two animals of exactly the same shape, with one animal twice as large as the other, both in the same gravity as indicated below. As any animal becomes larger its mass (and hence its weight) varies in relation to its unit length cubed, while the area (and hence the strength) of its legs varies in relationship to its unit length squared. The larger animal shown would have double the leg stress due to the effect of scale. This scale effect sets a boundary to the upper scale of all life in our gravity since a large animal's legs would eventually break due to its own weight. The mathematical relationship of scale governs the size of all land based life, so as all land-based animals increase in size their strength-to-weight ratio reduces until they reach an upper size limit. This upper size limit affects all land life, including land animals, flying animals, plants and insects. This upper limit on the scale of present day life is the reason why it is so surprising that dinosaurs were gigantic. Today's life appears to have reached the maximum size achievable, but life during the dinosaurs' time was much larger. But, this larger relative scale could be explained if all life weighed less because gravity was less at that time due to a Reduced Gravity Earth. In a reduced gravity life would be shifted towards a larger scale exactly as we see in the fossil record.